The spooked horse is going to run somewhere – wherever they think “safety” is. 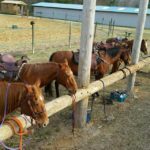 Pat Parelli helps this horse owner learn how to make his adopted “rescue” mustang gain confidence and become calmer. A horse’s survival depends on his ability to flee and outrun his predators. An experienced horseman will embrace and work through this natural characteristic of the horse. The first step is to gain the horse’s trust. Pro trainer Pat Parelli then shows the horse owner how, if he can bend his spooking horse, he can control him. The owner also learns about the effectiveness of pressure and release of pressure, to get the desired response every time. 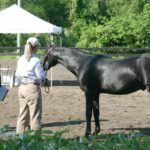 Parelli helps the owner understand how to keep the horse’s head facing the “danger.” This is an important step, rather than allowing the horse to turn and run from or kick at the danger. Once the spooked or reluctant horse starts to learn obedience through patient training, he also starts to relax. It’s nice to watch. The horse begins to pay more attention to his “leader” than to the scary sights and noises. It all begins with Pat Parelli’s essential ground work that carries through to saddle work. This is a great learning video of an owner who is asking for help, and a well-fed mustang that just needs the right direction. Both horse and rider really start to come around to the desired effect.